Ageing, the process of growing old, progresses at an incredible pace in the annual killifish. Some killifish populations have a median lifespan of only 4 months while others live substantially longer (but still less than a year). Uniquely among vertebrates, this is their natural life history to cope with the transient environment of temporary pools in African savanna. The period of aquatic phase – when killifish need to hatch, mature and reproduce – may last 1–6 months in the wild. For the rest of the year, entire population survives as embryos encased in desiccated mud of the pool bottom, waiting for new rains to come. 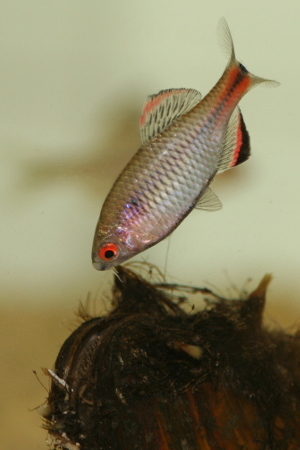 As a consequence, Nothobranchius killifish live incredibly short and fast lives. Importantly, their lifespan is condensed rather than preliminary terminated, and they suffer major ageing-related problems such as development of spontaneous tumours, decrease in fecundity and fertility, and other functional declines. Combing work on wild and imported wild-derived populations of African killifish from Mozambique and established laboratory strains, we use Nothobranchius fishes to understand the biology of ageing, ecology of embryo development including diapausing stages, and life history trade-offs. Our work mainly includes the turquoise killifish, Nothobranchius furzeri, and other species from Mozambique. Recently, we expanded our interest geographically and started field investigations in Tanzania. We combine fieldwork and experimental studies and aim at holistic approach to understand annual killifish ecology, physiology, and evolution. In addition, we have included Neotropical annual killifish in our research agenda, aiming to build a comparative framework. Check out a quick guide to killifish biology, breeding protocol, comprehensive review, book chapter on their ecology and evolution or recent review on N. furzeri natural history. Primary papers can be accessed via killifish-specific tag within publications. Brood parasites relinquish all parental care to host species, typically at a major cost to host’s fitness. Obligatory brood parasitic species are known among social insects and birds, but exceptional in other lineages. We study the only non-avian vertebrate known to be obligate brood parasite – the cuckoo catfish, Synodontis multipunctatus, which parasitizes mouthbrooding cichlids in Lake Tanganyika. Mouthbrooding cichlids care for their offspring in the buccal cavity. 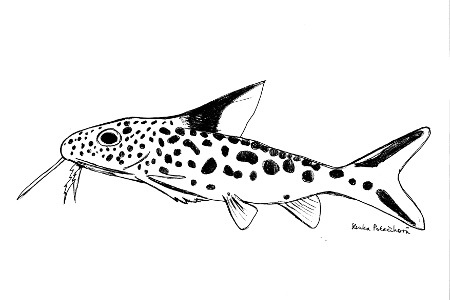 Cuckoo catfish intrude on cichlid spawning pairs and lay their own eggs that are picked up by the female cichlid. Young catfish hatch earlier than their hosts and feed on the host eggs and embryos. The host female eventually releases her brood, containing often solely catfish offspring. We have studied the system since 2011 and finally overcame all obstacles of experimental work, including obtaining a suitable aquarium space. We see this research as a great opportunity to understand the evolution of brood parasitism more generally than from an avian perspective. Coevolutionary relationships are ubiquitous in nature, from mycorrhizal associations to infectious diseases. Given a tight dynamics of mutually targeted adaptations between the partners, expansions and translocations (at species and population level) should have major impact on the functionality of the relationship and impact on each partner. However, it remains largely unexplored how current human-mediated reshuffling of biotic communities affects coevolutionarily-driven associations. 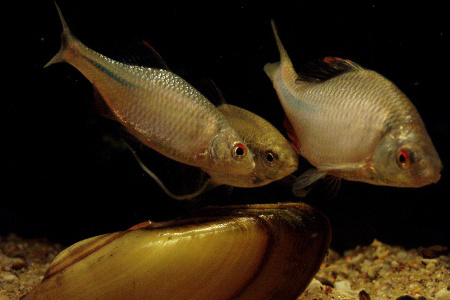 Bitterling fishes are small cyprinids possessing obligatory association with freshwater mussels. Bitterling lay their eggs in the gills of mussels and, in turn, mussels require a fish host for their parasitic larvae to complete their life cycle. Hosting fish embryos and mussel larvae is costly, leading to a fine-tuned arms race to exploit the other partner. We have extensively studied this association over the last 20 years. Currently, we primarily focus on the effect of an invasive Asian mussel (Anodonta woodiana) on populations of European bitterling (R. amarus). European mussels are parasitized by the bitterling in Europe – hosting bitterling embryos with a cost but unable to use bitterling as hosts for glochidia (parasitic mussel larvae). The Asian A. woodiana reversed this association – it ejects embryos of the European bitterling and its glochidia readily parasitize its gills, fins and skin. We have shown a fascinating variability in the effect of A. woodiana on European bitterling populations across Europe, with indications of rapid evolutionary responses. We continue to investigate the outcome of this reciprocal relationship in the Asian part of the bitterling range (with over 20 bitterling species in our study area in China), where the relationship ranges from mutualism to one-sided parasitism. Read a short note on host-parasite reversal, extensive (though now out-dated) review on bitterling-mussel relationship or our recent review on cryptic invasions. We have a long-term interest in understanding the causes and consequences of mate choice. Our research focuses particularly on alternative mating tactic, sperm competition and sneaking behaviour, cues used by females in mate choice, population consequences of mate skew, and the effect of resource distribution on the success of territorial males. 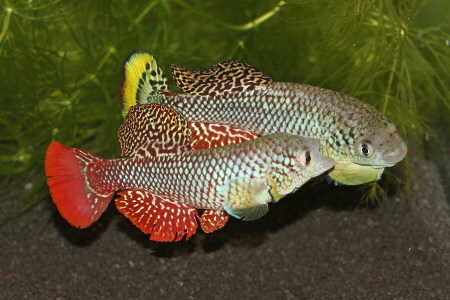 While most research is done using two species of bitterling (Rhodeus amarus, R. ocellatus), recent work included African killifish (Nothobranchius spp.) and Endler’s guppies (Poecilia wingei). Read the assay on male sneaking tactic from a female perspective or research papers on the link between spatial cognition and success of male sneaking and density effects on the success of territorial and sneaking tactics.